Roc, a small flourished planet, populated with hundreds of thousands of various species, one of the most intelligent of all, the Humans. Masters of all the arts, Humans are the superiors of Roc. Roc is built up of many archipelago and islands, none of which to carry more than 5 cities. 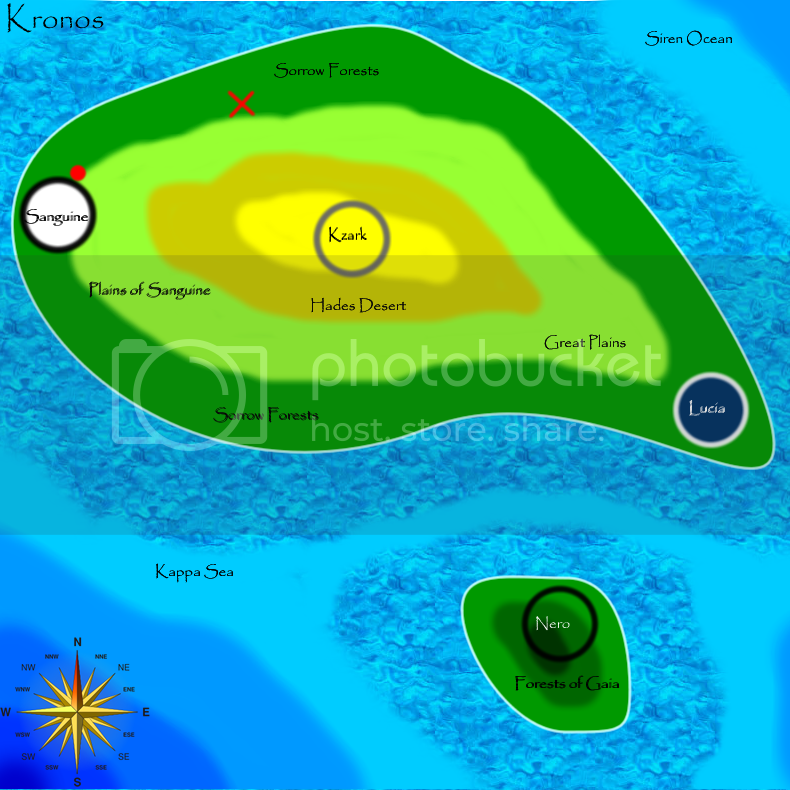 Kronos, is the largest of all islands. Filled with beautiful forests blessed by Gaia, sandy and arid lands known as the Hades Desert, rocky plains, and sticky swamps; it is probably the best place to live in all of Roc. Kronos is also well known for it?s worlds capital, Sanguine. Home for the many soldiers that battle against the fiends of Roc, and the most infamous of, the great sorcerer Solomon and his demonic offspring. Some say he is the son of Hades himself, and that he is half demon half human. Six wholesome warriors, all wish they were able to participate in these wars against Solomon, but unable to as they are still too young, all of them at the age of sixteen. It is no coincidence that when Solomon planned an attack on Sanguine that these six met up. When all the peasants and farmers fled to the inner walls of the city and the soldiers of Sanguine rushed to guard it. The boys on the other hand, all stood in the centre of the city anxious to get some action. Solomon?s army started crashing through the gates of the ?iron walls? of Sanguine, and bodies flew alight. Sanguine?s defence was failing, and they needed reinforcements from Kzark. The boys just stood there in grief. Kiserai the scout pointed out a messenger on the floor, a few feet in front of them, his legs torn off. The boys rushed to his aid. ?Take this letter?? The man asked, taking some of his few last breathes. 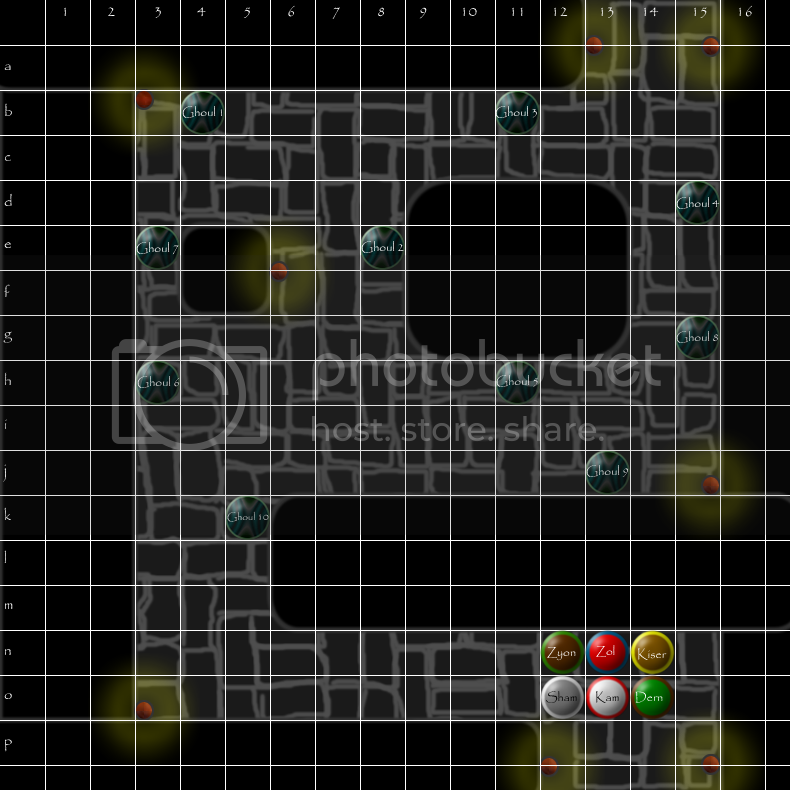 ?Go through the underground passage, beneath Sanguine?s castle. And I beg of you to be careful, as you are most probably Roc?s last hope.? He slipped the letter along with a map of Kronos in Kiserai?s pocket before slumbering to his death. The boys rushed the castle, focused on the task. They entered noticing it was empty. They searched for the secret passage door, before the ceiling came crashing down. Thirty minutes had passed as one by one, the boys got up, realizing they were taken down underground into the passage. They slowly walked a bit further, it was pitch black. They saw a flickering light in the distance, and raced towards it. ?Yackk! It smells here.? Shamone complained. ?I think I know why!? Yelled Kamrad. Foulish ghouls crawled up out of the darkness onto the passage. The group was not expecting to fight, so they are not well equipped. Read the "HOW TO PLAY" section in my first post. For this first battle, after our turn is done the enemies will not move, just to make it easier, but in the next battle, enemies will move as normal. You only get 3 moves each turn! Quick question: Can we 'see' all those enemies? Meaning if I use the skill to attack any enemy on the field, I don't have to worry about line of sight or anything, or do I? Also, is attacking considered a 'move', or can we move our 3 steps and still attack / defend / etc. ? For your skill, no you don't, but if you want to do a norml attack, the range you have matters. ATM you have a short bow, and I think your range for that is 4 squares. And no attacking is seperate. when I mean moves, I mean as in how many steps you can take. I think a smart think for you to do is move west once, and attack the ghoul, cause with your range you can reach him. hey, y am i in front with mr.meatshield? ps: is it just me or is the ghouls insanely hard to do damage on for a thief? You and Shamone are in the frontline because you both do melee attacks, so you hav eto get to enemies quicker. Whereas everyone do ranged and magic attacks. Are you saying that it's hard for them to hit you, or you to hit them? And yes you got an extra item because in your description you said you had a blade, and the best thing I could do was make it a high level item. Also I'm planning on you having find out about your families past later on as part of the story. As in, 4 squares in between me and the monstie, or just 3? Also, is there some kind of cooldown on our spells? Like, since I used my skill, can I use it again next round, since I have enough mana? One other thing, sry lol. Does mana regen start at the begining of my next turn? As in, there isn't some kind of cooling period for mana regen. Some games I've played do that, and I think it makes sense. The second you get a cut, does it start healing? I think the same should go for mana regen and hp regen. But only from the 1st hit. After that you're already healing so it doesn't matter if you're being hit. Just me and my wonderings... Sorry. Also, the OP says shortbows have a range of 5 squares (so 4 or 5?). Just out of curiosity, can he do that? I'm not trying to dis him or anything, but he attacked in a weird way and I wasn't sure if we could do that. But that's a good thing I guess. 1. Ok, squares start from infront of you, so you yourself does not count when counting squares. 2. There are no cooldowns on spell, otherwise I would've specifide that earlier. 3. Mana/health regen, I'm deciding to change it a lil, it's going to be every 2nd turn, otherwise it doesnt quite work out as well, unless i decide to change it again. But you mana/health regens as soon as your turn starts, so you will have regenerated 1 mana/health in that turn. AND REMEMBER GUYS TO CHECK OUT THE HOW TO PLAY SECTION!!!! Let me rephrase this. Charcter is O Monster is M and just a square is S. It's O S S S M and I can shoot him? But not O S S S S M, right? I actually edited that one. I forget it's there. It was something that made no sense to even me. But yeah, got it. I didn't see you post that anywhere before, the OP only says the enemy must be 'within range', and it would be, so I thought it was okay. We can move diagonally, figured we could attack diagonally as well. Two-handed weapons - 1 Square; North, North-East, East, South-East, South, South-West, West, North-West. Why can 2H hit diag? If the argument is range / reach, you'd think magic / ranged would have the same advantage. Oh well, it's all good. Yeah it doesnt make quite much sense. But 2H has a "Swipe" or "Big hit" effect, allowing you to attack diagnally. But ranged attacks have the advantages of attacking from afar. I was teh only one to attack! Yargh! Now all I need is Zoltrix to post correct? If so, he has 12 hours to post before I update.